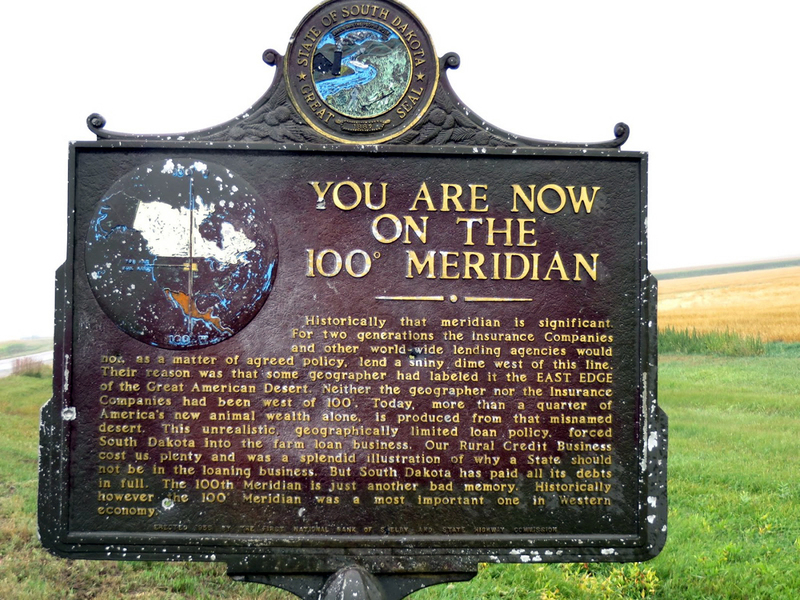 In 1997, I took an epic road trip north along the 100th longitudinal meridian from Laredo, Texas, to the Canadian border. The previous blog entries covered Texas and the Central Plains. 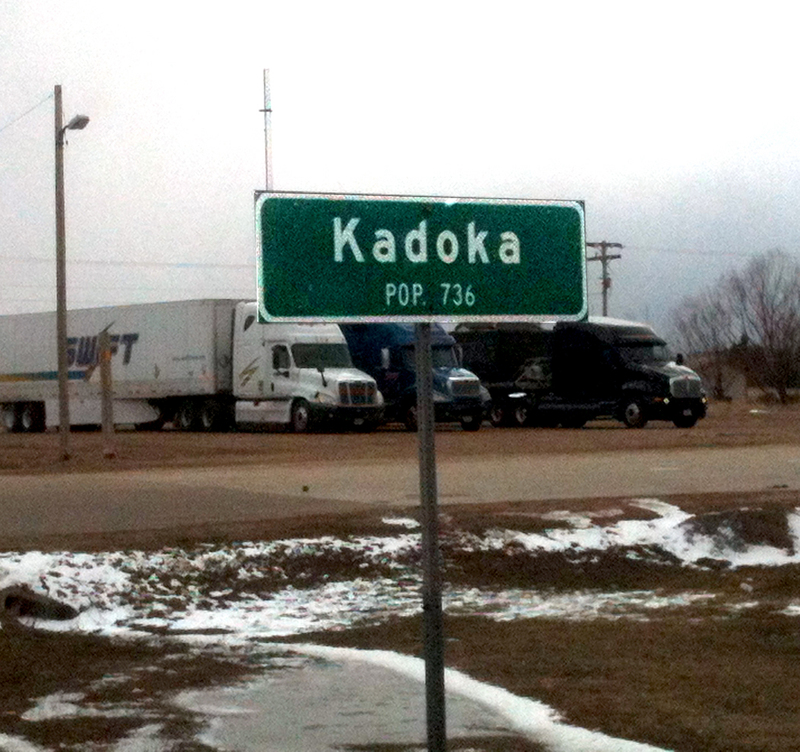 This final installment brings the Northern Plains and the end of the trip. 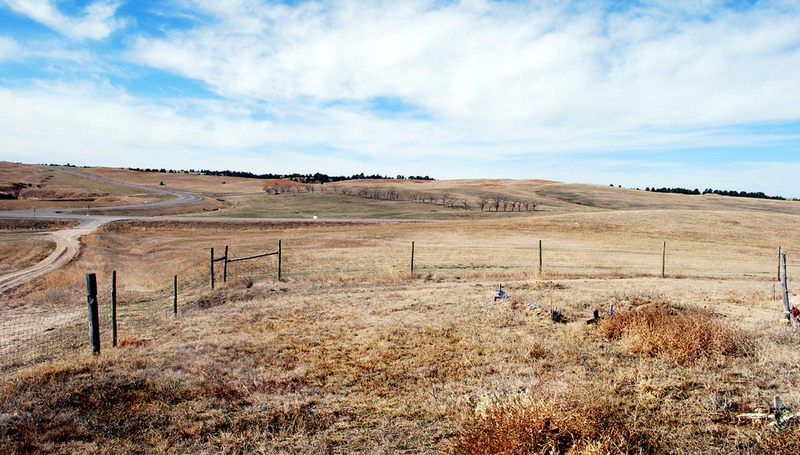 Mile 1294, Wounded Knee, S.D. Most of the action by the U.S. against the Indians in the past century was reprehensible at best. The list of atrocities is nothing to be proud of, from Sand Creek to Washita River. But one of these massacres bothers me more than the others. It is the photographs that make the difference. On Dec. 29, 1890, a Lakota elder named Big Foot and more than 200 of his band were gunned down by soldiers at Wounded Knee, S.D. The Indians had obeyed Federal orders to come to the reservation and had obeyed orders to give up their rifles. Big Foot was deathly sick and coughing up blood. But the soldiers didn’t believe the Sioux had given up all their guns. One remained, and as it was being turned in, a gun somewhere went off and the army went crazy, gunning down not only the Indians, but up to 30 of their own men. The Indians, wearing “ghost shirts” they thought would protect them, fought back as well as they could with knives, hatchets and a few pistols. But most of those killed were women and children. It isn’t the stupidity or the injustice that gets to me — there are many examples, not only in the so-called “Indian Wars,” but pretty much in all of history. Humans have not been good to other humans anywhere on the globe. No, what gets to me are the photographs. 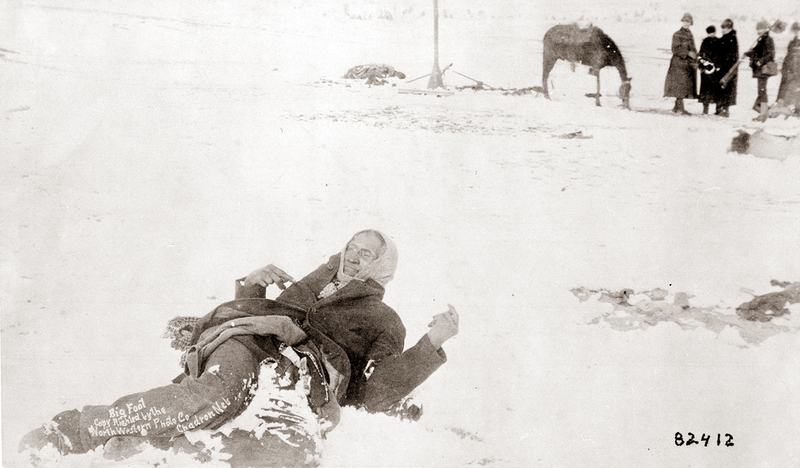 Taken three days after the massacre, they show the frozen, contorted body of Big Foot, with his hands knotted up arthritically and his body bent up out of the snow in frozen rigor. He is isolated against the blank, white background of the snow, and all the more symbolic for that isolation. A few soldiers stand off in the background talking and a horse puts his nose to the ground for some grass sticking through the snow. “A long trench was dug and into it were thrown all the bodies, piled one upon the other like so much cordwood, until the pit was full, when the earth was heaped over them and the funeral was complete. Many of the bodies were stripped by the whites, who went out in order to get the ‘ghost shirts,’ and the frozen bodies were thrown into the trench stiff and naked. “They were only dead Indians,” he added, with an accusatory dose of irony. There is another set of photographs that come to mind — the emaciated, contorted bodies being bulldozed into mass graves at Dachau and Buchenwald. For many, the Indian Wars are just cowboys and Indians stuff from a long ago history. But for me, they sing of a continuity of outrage. The “Final Solution” of one century mirrors that of its predecessor. So, I have wanted to visit the site at Wounded Knee and when I got there, was surprised to find it barely marked at all. Perhaps both sides feel shame over it. The whites for the evil they don’t like to recognize in themselves, the Indians for the humiliation. 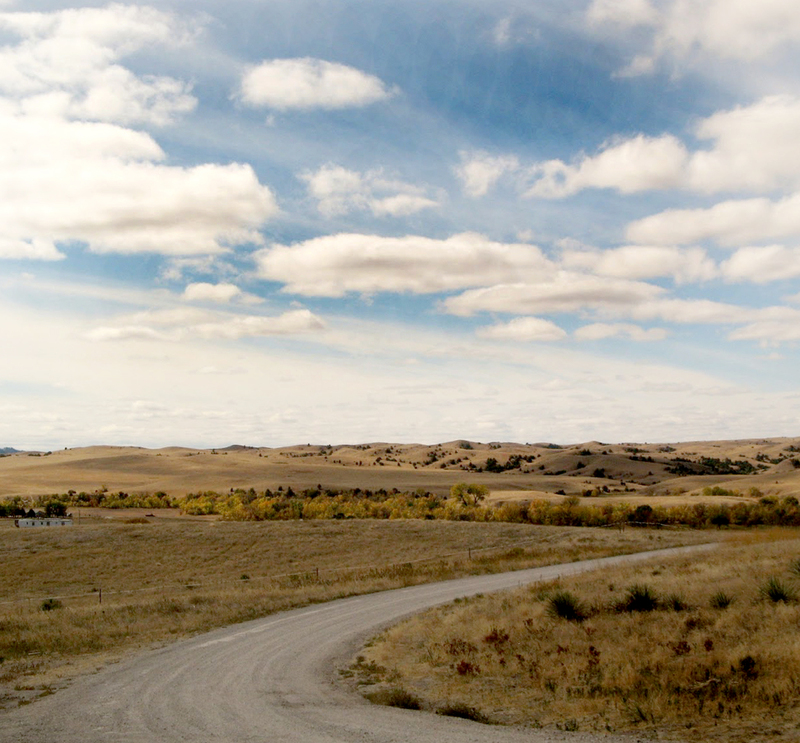 The Pine Ridge Reservation in southern South Dakota is more beautiful than it has been described, with grassy hills and cedar trees dotting the plains. While it is true that poverty is endemic, it is not the fault of the landscape, which is better than some of the grasslands I passed through in Nebraska on my way north. But the actual massacre site is little more than a spot in the road. There is a hand-lettered wooden sign that describes the event, but there are no official markers, no commemoration, no visitors center, no rangers ripe with interpretation. 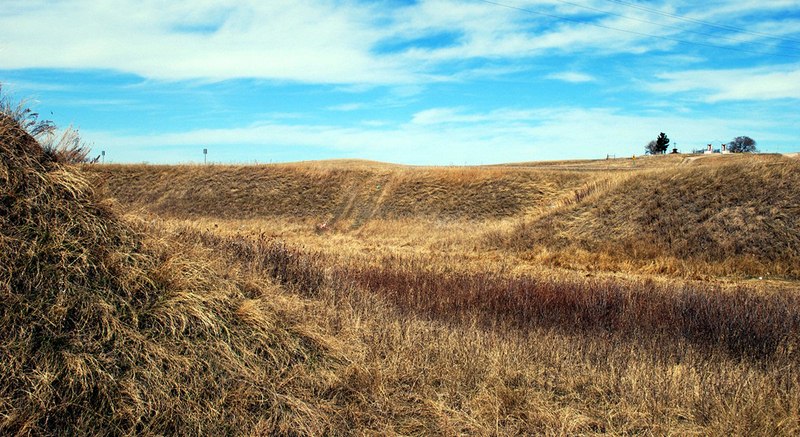 The dusty ground at Wounded Knee is a gully with the bridge on one side of the road, and a hill with the Indian graves on the other. During the battle, troops had placed cannons on the hill and lobbed exploding shells down the slope at the Indians. There are also a few ramadas. In the summer, there are booths selling Indian crafts. In October, most were empty, although there were two young Lakota girls with a clothesline strung with dreamcatchers. I stopped and asked them if this was the massacre site and they said yes. “Where did it happen here?” I asked. The older was about 12, the younger, 8. We talked about being Indian, about the effect of history and about the price of dreamcatchers. The girl looked caught out and gave me a distressed look, as if she hadn’t anticipated the conversation getting this far. “Why is she in the hospital?,” I repeated. A wait of two beats: “She’s sick.” It was almost a question. I felt more sorry for her being caught in a lie than I did for her probably imaginary sister, so I bought one. Mile 1379, Badlands National Park, S.D. Near Kadoka, S.D., the rolling grass of the plains is cut through by erosion, sculpted into spiky, spooky mazes of canyons and hills. They were called by the early French trappers, “les mauvaises terres a traverser,” or “bads lands to cross.” And they certainly would be, if it were not for the smooth roads of the National Park Service. The Badlands National Park is a long, gangly loop of lands lodged in the corners of the Buffalo Gap National Grassland and the Pine Ridge Indian Reservation. In places, the park is less than a mile wide, although if you walked from one extreme to the other along its length, you would hike a semicircle of something like 60 miles. Most of it is flatland. As you drive along S.D. 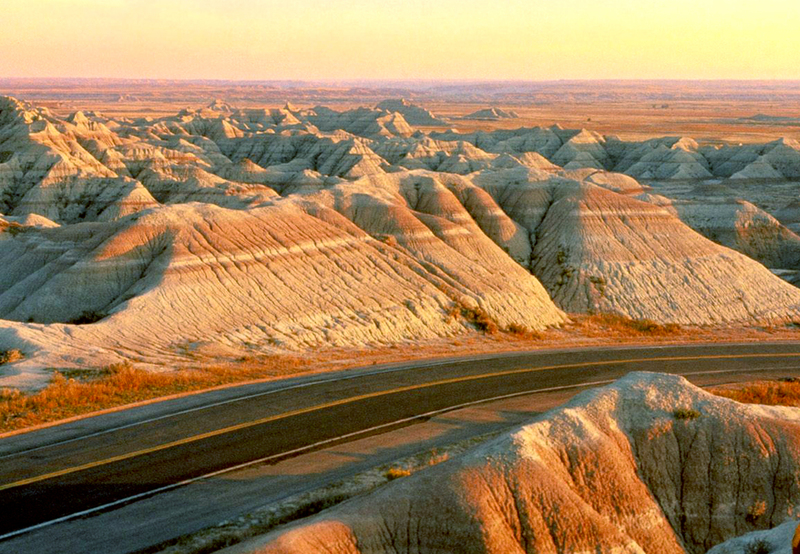 44 from Scenic to Interior, the badlands themselves are a whitish line of crenelated hills on the northern horizon. Only when you get close to them, near the Ben Reifel Visitor Center at its eastern end, can you really appreciate the blasted, washed out, weathered exhaustion of them. 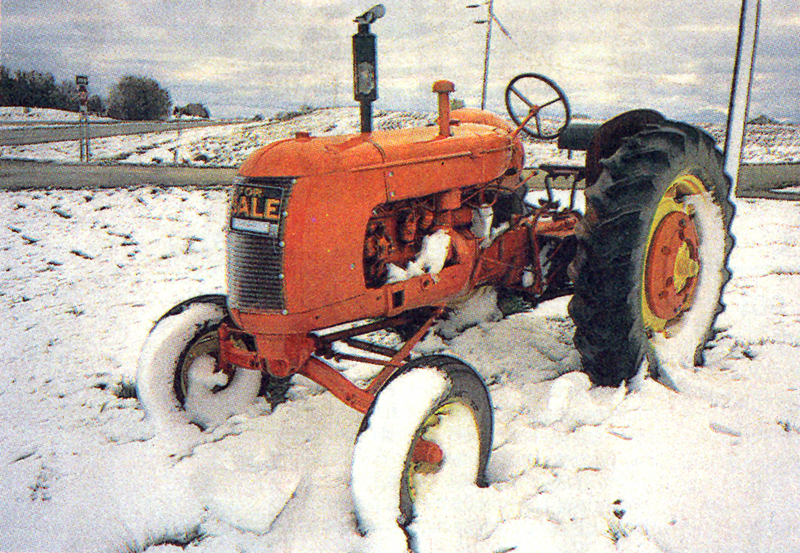 A freak October blizzard blew across the Dakotas. One day, I was in Pierre, S.D., and it was 80 degrees; by the time I pulled into Bismarck, N.D., the next day, a front had barreled through and the thermometer had dropped into the 30s. With winds at a steady 50 mph, the wind-chill was more than a TV weatherman’s conceit: It could mean frostbite. 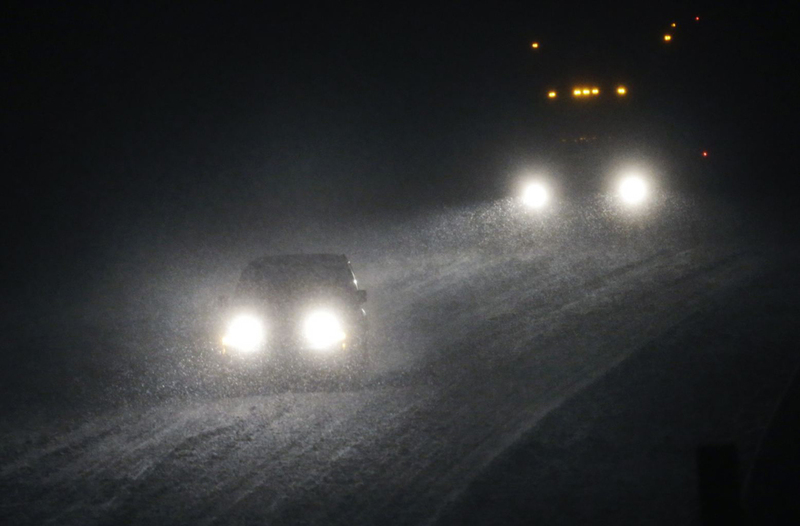 During the overnight, a line of powerful thunderstorms had run from Texas to Manitoba along a cold front that moved east with the speed of a freight train. Tornado warnings were issued for the whole length of the front. 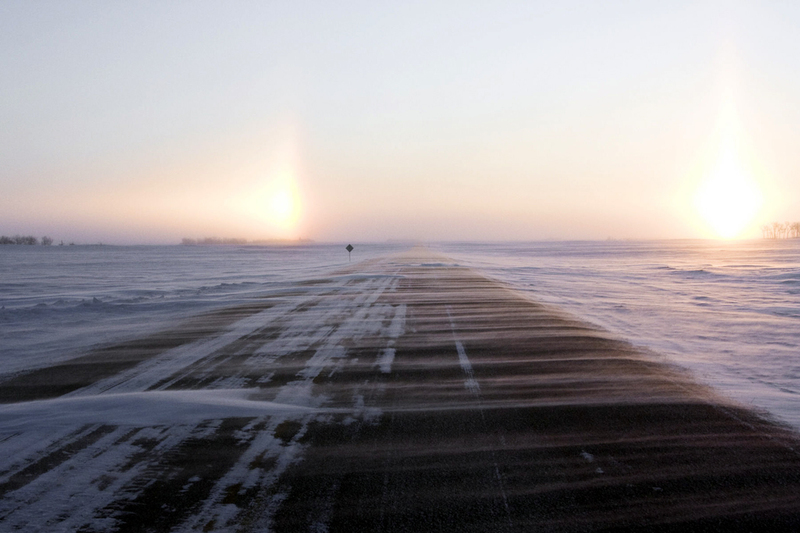 One day the Prairie population was talking about their tomatoes lasting so late into the season, the next day, they are scraping windshields with parkas pulled tight around their cheeks. 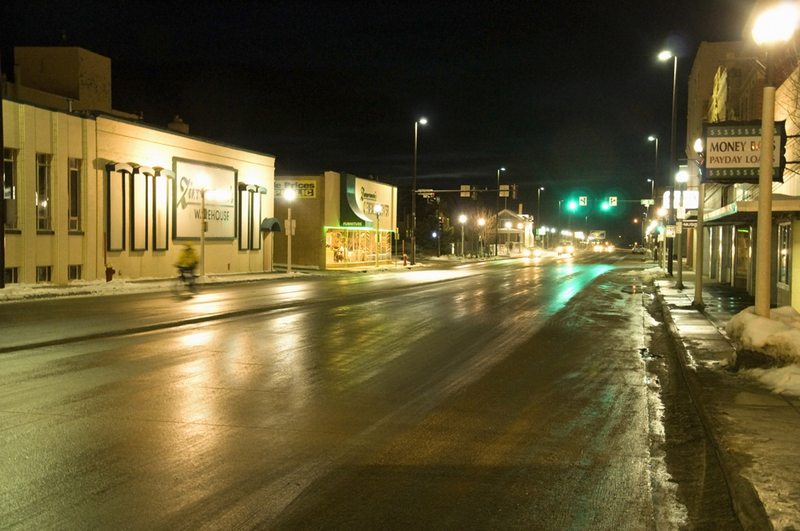 Just before the blizzard moved in, I wandered through the streets of Bismarck, looking up at the sky that was turning ever more slatey and frigid. To get in out of the cold, I wandered into several downtown stores, including one antiques shop. The woman behind the counter also does home interiors: One side of the shop is given over to fabrics, the rest to consignment antiques. The proprietor was a bubbly woman of about 50, who praised the plainness of the Prairie people. But there are cosmopolitan Bismarckians and those who are less so. “I ask my customers if they’ve ever been out of North Dakota,” she said. “If they have, I know they’ll go for the weird things, some of the more tasteful and unusual treatments.” She fingers one of the fabrics that is tightly gathered with pleats. I told her that I take it to be an inborn modesty they seem to have in the Plains Midwest, a desire not to appear more fashionable than they are. As I begin driving again, the skies have begun flaking and the crystals blow around the pavement like sand blown across the beach in a storm. What are predicted are snow showers and snow squalls, but by the time I’m 100 miles out of Bismarck, it is a full-scale blizzard. Luckily, the roads are still warm enough that nothing is sticking to them, although the farm fields are speckled with white, catching in the furrows making a scumble of white and black. It is a tailwind, so as I drive, I hardly notice it, except to see the grasses bent sideways and vibrating on the shoulders. And the snow dances on the pavement in front of me like some sort of fairy mist, swirling and shifting. I can see the flakes bobbing around in front of the windshield. But when I stop at a rest area and step out of the car, I can see that the snow is rushing past me horizontally. I can barely put my foot down where I intend as I walk through the gale. Visibility is reduced at one point to less than a tenth of a mile; the world is whited out and the windbreak trees at the other side of the cornfield are faint ghosts. Contending with weather like this, I decide, must make you modest. You are not likely to believe the hype of the American media siren when you know a pair of jumper cables can save your life. By the next morning, the wind has died down, although the snow flurries continued. When I set out again, the landscape is white and astonishing. Mile 1869, Canadian border, N.D. It seems as if there is nobody left on earth. 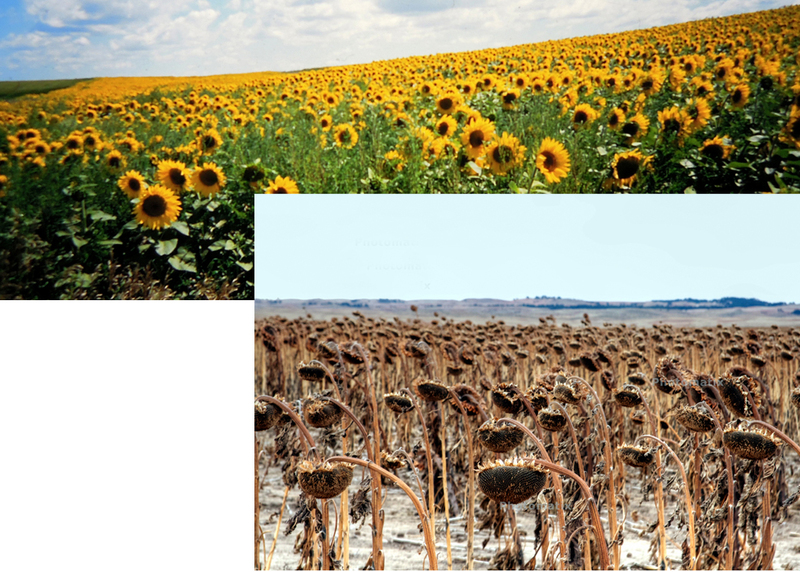 The hills are empty of buildings and if it were not for the tractor paths through the fields, you might actually believe that the acres and acres of sunflowers grew there naturally. In the summertime, the expanse of yellow is astonishing. I have driven through North Dakota when the sunflower crop is as brilliant as trumpet music. In October, though, the color is gone and all the heavy seedheads, browned and dried, bend over like so many showerheads — and all facing east. These giant flowers should not be confused with the roadside sunflowers that cover the Great Plains. Those, with their ten or a dozen three-inch flowers per stalk, swaying in the breeze, are delicate and lacy compared with the commercial variety that grows in the fields. Each of those grows a single giant flower on a woody shoulder-high stalk with a central disk crammed with the sunflower seeds we nibble on at ball games. But it isn’t as snacks these fields are filled, but for their oil, used in food processing. You can see them in the summer, armies of them, over the rolling hills, cut through only by the two-lane blacktop and, every few miles, a farmhouse surrounded with its outbuildings, fences and a couple of pickup trucks parked in the gravel driveway. 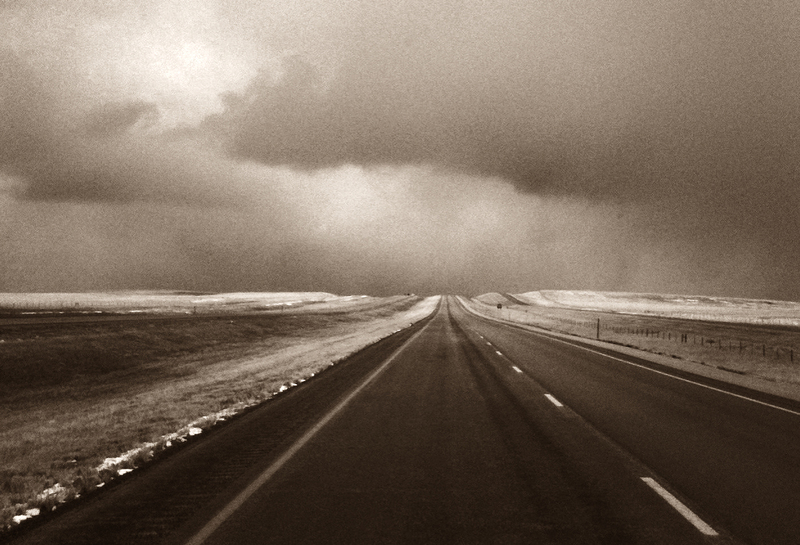 I first came through North Dakota on a train, some 20 years ago, and I was fascinated by the lonesomeness of the land. Neighbors are miles apart; the only way you know you are on an inhabited planet in the winter is to see the smoke from a distant chimney coming over the snowy rise. And it seems to me, as I finish my odyssey up the 100th Meridian, that it is this Heartland that seems the most American to me. It is this country of Thomas Hart Benton paintings and Hamlin Garland books that seems to hold the nugget of Americanism. New England may have been the intellectual center of the growing nation and the twin coasts may have driven the commercial development. But it is this central axis, furry with grass, that has been and remains the heart of our country. It is the Plains that spread out in front of the wagonloads of pioneers and gave them the epic sense of continental expansion. It is the Plains that separated the Atlantic and Pacific, as guts fill the space inside our skin. It is the Plains that gave the country its defining metaphors, whether cowboy, Indian, sodbuster, religious migrant, long stretching miles of highway or landscape that must be tamed. We learned self-reliance and cooperation, we learned how to adapt when we must and how to maintain tradition when we could. It is the Plains and the Indian Wars that provided us — second only to slavery in the South — with the guilt that gives emotional complexity to our national naiveté and, when we don’t deny the sin, our depth as a people. In the cities of East and West, we can pretend that society is paramount and that human beings have charge of the world. It is in cities that theories are propounded. But in the Plains and prairies, we are forced nakedly into the realization that we live on a planet, with the racing sky above and the blackbirds dotting the snow beneath.